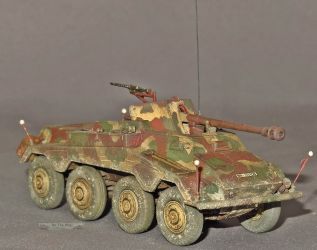 While 1/72 scale modelers have had to wait for a long time for an injection molded Sd.Kfz.234, the waiting was worth it and we now have ample choice. Doug Chaltry has written a comprehensive article that sums this all up very nicely. Hasegawa is one of the brands that jumped on the bandwagon and while Hasegawa's kits aren't always the best on the market, the Sd.Kfz.234 series they released is one of my all-round favorites. So far Hasegawa has released the /1, /2 and /3. 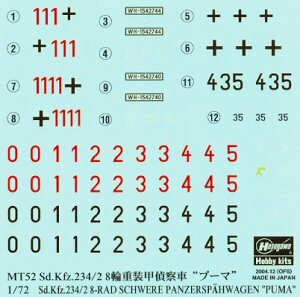 I had hoped they would have followed up with the /4, as they basically have all the parts needed (combining these kits with their Sd.Kfz.251/22), but this possibility now seems very remote. As I am not the only one who has high esteem of these kits quite a number of previews and reviews have already been written of these kits, links to which can be found in the abovementioned article. As I have a sweet spot for the "234", I decided to build all known variants (6 in total) based on the Hasegawa kits. Prelminary note: for an overview of the production and evolution of the 234 series, this short article might be interesting. In my opinion the manual is extremely good. Some parts are named and attention is drawn to possible mistakes, like the possibility to install the transmission cover on the lower hull the wrong way around. The English used is sometimes a bit, well, say "unorthodox", though. The decals appear rather thick on the sheet, although they are actually not that bad when applied and given a coat of setting solution. Hasegawa sometimes allows some to be used "freely", whatever that may mean. The lower hull is common to all kits and is very well detailed, with good fit, even though (as I discovered) installing the lower rear hull plate before mating the top and bottom hull is not necessarily the best idea, as it can (and invariably will) result in a small gap. There is also an overhang between the upper and lower rear hull in the kit which I believe should not be present. The way the kit is engineered, the wheels can easily be installed at an angle to represent a turning vehicle. 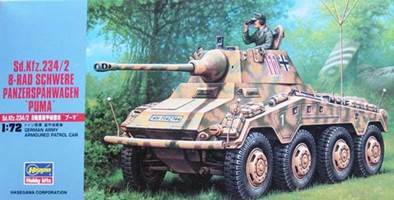 (The Sd.Kfz.234 had 8-wheel steering, by the way.) Seen from the front or the rear the wheels should have a slight V-stance, which Hasegawa didn't readily provide. Most judges will interpret the V-stance as a construction error anyway, trust me. 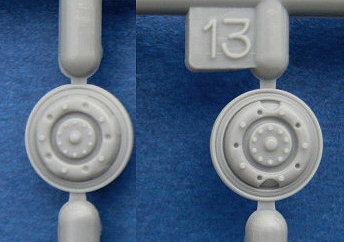 The two sprue "C"s contain a total of 12 wheels/tyres with 2 different types of thread and 2 types of hubcaps. So, although you only have enough of one type to completely outfit the kit, you can choose to have some variation for some of the wheels. The manual has different wheel-types installed on station 3 (L&R), although I fail to see why you couldn't just use them anywhere, representing a field replacement, or use the same wheels as on the other stations. As I was building 6 kits at the same time, I had some better possibilities to play with those hubcaps (even though I replaced the wheels with aftermarket parts in some of my kits). Note that the wheels are perhaps the most disappointing part of the kit with a rather soft thread pattern, while the hubcaps might have been better detailed as well. The fenders are of the intermediate (most common) type and (unfortunately) are hollow underneath, but normally you won't be able to see too much due to the presence of the wheels. (I have no idea how the fenders looked like on the underside anyway.) Opening up the bins requires some delicate surgery. Installing the fenders is made easy due to the shape of the hull and locating pegs, even though some care is needed to ensure a snug fit. The fenders also hide any seam that might exist between the upper and the lower hull. There is a molding seam on the top of these fenders, which I took for a welding seam at first. I now believe that the fenders should be smooth in that area. I discovered this too late for one of my models. Most tools are molded on the fenders but are decent nevertheless. If you like to show a bit of the interior (which is mostly the case for the open topped vehicles), then the awkwardly positioned ejector marks on the inside of the hull might be a challenge to remove. Speaking of the interior, some equipment (like gas masks) is missing, but some eye candy is provided in the kit nevertheless. One thing that I didn't immediately catch is that Hasegawa has modeled the rear seat in the folded down position (as it would be when not in use), thus showing the springs in the backrest. I found the front seat rather poor. On the other hand, it must be said that it will be hard to see, even in the open-topped vehicles. As far as I can tell part A7 is an ammo rack. If so, then I doubt whether it would be the same for all the three variants that Hasegawa offers. As far as I can tell the /3 had a rack that best resembles this part. As this variant will show most of its interior to the public, this seems ok. I am not 100% sure which side is up (the instructions are exceptionally vague here), but I think the way I've fitted it in the vehicle shown above is correct. The instructions seem to tell you to install and remove part A1. It might be that only the small tab below the part needs to be removed, which would actually make sense. Note that this part represents the gun cleaning rods and as such is only accurate for the /2 (and perhaps the /4). It is nice that width indicators are given, even though they are a wee bit overscale. The rear view mirror on the left front width indicator might also be positioned a bit higher. The visors have recesses behind them, but opening them will require surgery to open up the hull behind. The horn is included. This is a part often forgotten in kits in general. Hasegawa has you install headlights on the left and right fender for all variants, which is only correct for the /2 as far as my references teach me. A weak part of the kit are the lifting hooks. These are represented as miniscule tabs and might do with replacement. The MG42 (needed for the /1 and /3) is mediocre. The instructions let you choose to install part A8. This is the armored base for the extra star antenna of the command version. It seems that a lot of non-command vehicles had the pot pre-installed so they could be turned into command vehicles in the field more easily. For my kits I used the PE star from Modell Trans, which at the time of writing is sadly out of production. If you would like to use the hub of the spare tyre without a tyre, you can get by just omitting the tyre, but then you should either accept that the rim is not fully correct, or modify it. Note that you need to drill out a hole in the rear plate if you want to install a spare tyre, which means the hull will stay "clean" if you just leave it off. The jerry cans lack the detail showing the three handles. Careful scribing will handle this. Installing the tarp (B10) will block the view from the rear visor. I have not yet seen a similar tarp in photographs of the real vehicle. According to Doug Chaltry the dimensions of the kit(s) are mostly accurate. The front bumper is a difficult fit as the angles of the different attachments just don't add up. After much trial and error, the only solution that worked for me was to drill out the attachments in the nose (giving a sturdier attachment), removing the lateral braces (that go to the fenders) and replacing them with strips of plastic. Only the /3 comes with the late style exhaust, although the /3 also used early types and the /1 also used late types. I discovered that the mufflers and exhausts in the kit are actually indistinguishable between types; only the pipe between the hull and the muffler is distinct. It is thus rather easy to convert any kit from one type to another. A figure is provided, which is nice, even though it is not the best I've seen. It has an optional arm holding binoculars. 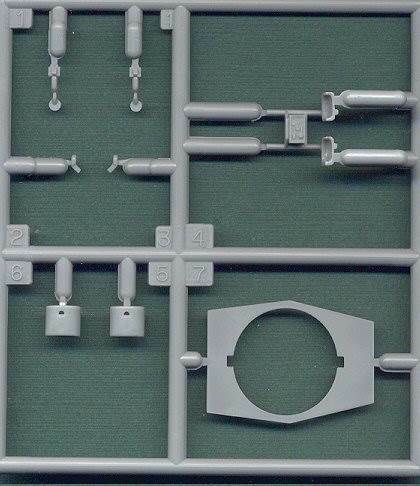 Kit MT53 has two specific sprues, for the top of the hull (shared with the /2) and the turret. One's attention is immediately drawn to the solid mesh, which is - by far - the weakest point of this kit. I replaced mine with the Modell Trans PE set (MTX7201). The /1 only had one headlight (on the left, together with the horn). It did not carry the cleaning rod (part A1) on the left side of the hull. It probably did not have the same ammo rack as the /3 (which I guess is what part A7 represents). I added an antenna made from the remains of a setting pin to the turret. Thin down the edges of the small shield that is attached to the main gun. Replace the barrel with a metal part (which I think came from RB Model). Install a late type exhaust. Replace the exhausts by short sections of brass tubing. Replace the wheels with Attack resin wheels. 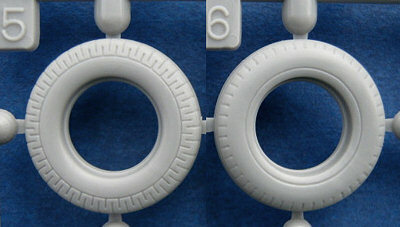 Replace the width indicators with the ends of setting pins. 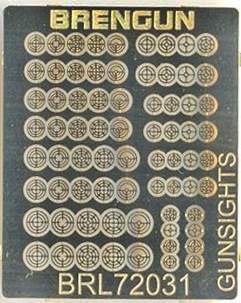 Add a ring sight from Brengun. The gun can be positioned at an elevation. The ejector marks of the roof plate (part D7) are on the same side as the rivet detail, which could easily have been avoided when designing the kit and now requires filling and sanding. 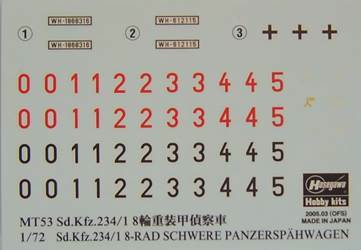 The marking option is a vehicle of 4 Pz.Div. with a hard edge camo and is (most likely) equipped with the late fenders with only two bins. It happens to be the same marking option as Kagero gives in its Photosniper book. A picture of the vehicle also shows it without the cover of the (single) headlight and without a horn. I decided that my vehicle would be a sister vehicle to that one as I didn't fancy modifying the fenders. 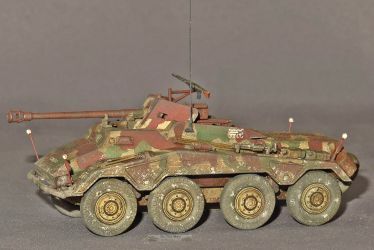 4 Pz.Div. Kursk marking (arrow). The Sd.Kfz.234 was not yet operational during the Kursk battles. 130 Pz.Div. / Pz. Lehr (L). spare black/white and red/white numbers in different styles. I used decals from Almark (set T3 for the black crosses) and Aleran (GE-2 for the licence plates). The resulting markings and camo are purely speculative but similar to a known vehicle. A very easy and worthwile addition might have been the levers for the rear driver's position which are quite prominent in an open topped vehicle. Use the Goffy set. While the set is nicely done, I am not really convinced of its value. Still, it allowed me to avoid using the gun barrel which comes with the kit and which is too narrow. I added a star antenna from Modell Trans atop the shaft of a setting pin. Hollowed out the smoke grenade launchers. If you want them loaded, filling them in might be an even better idea. Make a spare tyre mount, used without spare tyre. 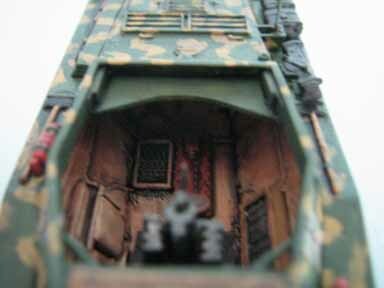 Add episcopes to the inside of the hatches and add some extra detail to the inside. I built a second, destroyed vehicle, and this one got even more interior detail added. Unless you open the hatches, the interior that Hasegawa gives you can be left out and used for other projects. If you open the turret hatches, adding the MG and KwK breech (with recuperators and spent cartridge bag) might be a good idea. I made mine from scratch, even though I used the Goffy set which contains a breech. I also added a couple of rounds and MG ammo bags. Note that my representation of the interior is speculative. You can choose between the extra box or jerrycans on the left rear fender. Check your references to see what you need. ("1111" needs the box for instance.) Note that the box doesn't fit too snugly. The Topfblende (aka "Saukopf") might benefit from a rougher texture. If you choose to install the hatches in the closed position, you need to remove the pegs. 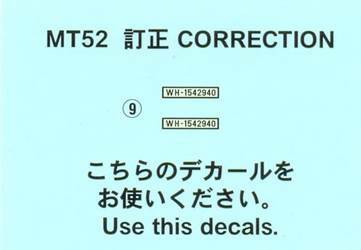 The marking options are for well-known vehicles of 2 Pz.Div. One of them happens to be the same marking option as Kagero gives in its Photosniper book. I decided that my vehicle would be a sister vehicle to those. 4 Pz.Div. Kursk marking (arrow). The Sd.Kfz.234 was not yet operational during the Kursk battles and 4 Pz.Dv. never had any Sd.Kfz.234/2 anyway. 116 Pz.Div. (greyhound). 116 Pz.Div. did not have any Sd.Kfz234/2 as far as historians can tell. an armoured recce unit (which can be used on this vehicle I guess). Earlier releases of this kit had a decal sheet with a wrong licence plate number and a corrective sheet. 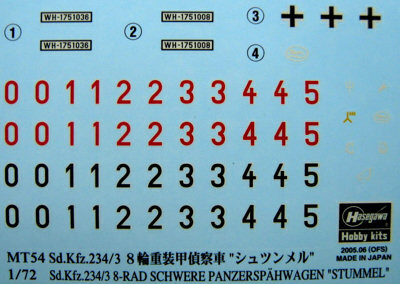 Later issues had a new decal sheet with the correct number but also somewhat brighter red colors which look a bit off. The turret with extra detailing. Left: another turret (for a destroyed vehicle) using the RB Models brass barrel (shortened at the muzzle side); right: both turrets together. This is where one of the vehicles ended up. A second one was built as a wreck. 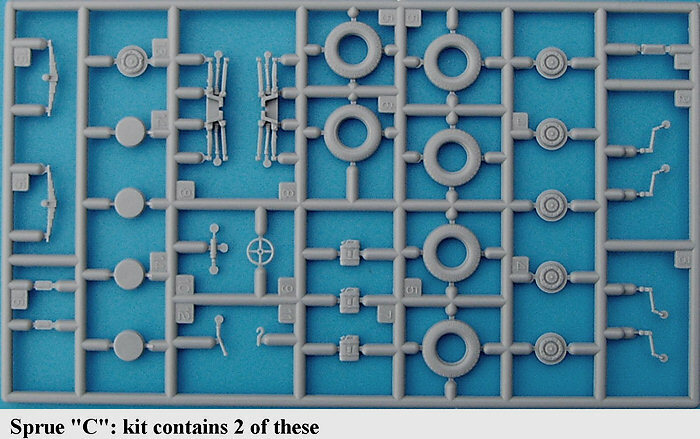 Kit MT53 has two specific sprues. 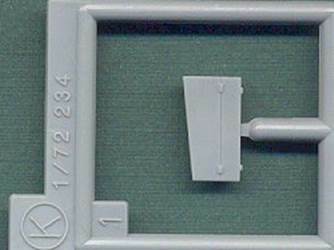 The "G" sprue contains the gun cradle and armored side walls. It also contains a late type exhaust. Historians are apparently still debating whether this exhaust was actually fitted during the war, or was only fitted on some vehicles after capture by the Allies. 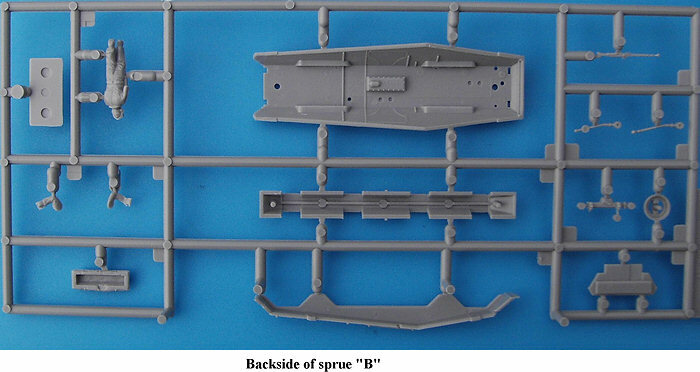 Sprue "J" is also for the Stummel variant, although this one is shared with Hasegawa's Sd.Kfz.251/9; as a consequence the sidewalls and other parts on this sprue are not to be used. The /3 only had one headlight (on the left, together with the horn). I replaced the width indicators with the ends of setting pins. I added an antenna made from the remains of a setting pin to the side of the crew compartment. I added a spent cartridge bag, periscope and handwheels from a TnT Sd.Kfz.250/8. The cartridge bag was given some texture by covering it with a piece of paper towel. I hollowed out the muzzle a bit more. I omitted two jerry cans and installed empty holders from the Eduard PE set for the /2. The gun mount can be installed without glue, which allows you to reposition it at will. The kit comes with the late type exhaust. (It's the only one of the three kits that Hasegawa offers to do so.) I used an early type from another kit. While a bit more rare, the Sd.Kfz.234/3 could also be fitted with an extra star antenna. It is not entirely clear how to install the radio set in the crew compartment. In hindsight, I should have thinned the walls of the additional armor on top of the fighting compartment. I used the decals and marking options from the Kagero Photosniper book. Sadly, Hasegawa didn't follow up on its Sd.Kfz. 234 series with a /4, which is surprising as they already have three Sd.Kfz. 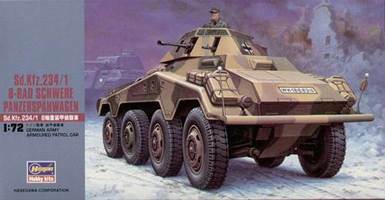 234 variants and the Sd.Kfz. 251/22 in their catalogue. It wouldn't have required much to produce an Sd.Kfz. 234/4. As I wanted some consistency in my series of 8-rads, I decided to convert a Hasegawa hull to the /4 configuration. I am not the first to attempt this conversion; previously, Dave Showell used four kits for his conversion: Hasegawa, Italeri, Roden and Dragon. 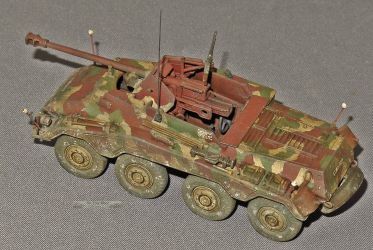 I decided to use only two: a stock Hasegawa kit (I don't remember which variant I started from, but the /3 would have been the best choice, in my opinion) and a Roden Sd.Kfz. 234/4, in order to keep costs down. I used Hasegawa parts for everything but the gun and additional armor. Roden then, logically, supplied the gun and said armor. The lower gun mount that the Roden kit provides isn't correct at all (cf. marked area in the scan of the instructions below), which meant that I needed to scratchbuild this area. As the vehicle is open-topped, a lot of the inside will be seen, and as the Hasegawa kit has no /4 interior and the Roden Sd.Kfz. 234/4 kit leaves a lot of interior to be desired, clearly, more scratchbuilding was required. In the pictures below you will see just how much scratchbuilding went into the lower hull. Grey parts are from Hasegawa, black from Roden and all other colors (mainly white) are scratchbuilt items. Almost invisible is the enhanced backrest of the front driver's position. I had a spare (folded) rear driver's seat, which has a nice spring pattern to it. I used this spare part to create the same effect for the upright front driver's seat. At that point I was quite sure, though, that it would be invisible with the hull assembled. As we will see, I was proven right and could have thus saved this part to enhance a kit where it would have actually mattered. 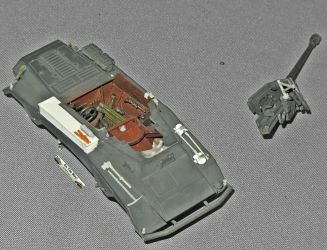 Note that my interior is not 100% correct, due to limitations of the Hasegawa parts, lack of references and the use of secondary sources (in casu the Dragon 1/35 Sd.Kfz. 234/4 kit). Also note that the final interior differs a little from the end result, due to necessary adaptations when mating both halves of the hull. Some sources claim that the rear steering station in the /4 was removed or deleted, e.g. 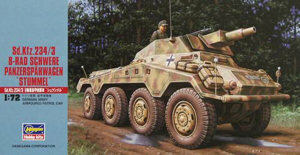 the article in the IPMS/USA Journal with walkaround photos of an d.Kfz.234/4 in England (since returned to Germany). That article states that there was no evidence in that vehicle of the gear being fitted in the first place; neither did it appear that it hadn't just been stripped out of the vehicle at some point. The inside of the Sd.Kfz. 234/4 was crammed enough without an extra, redundant steering wheel and seat in the middle of the fighting compartment, so this would make some sense. On the other hand, the Sd.Kfz. 234/4 in the Patton Museum definitely has a rear driving station. As the /4 replaced the /3 on the production line somewhat hurriedly after orders from the head of state, it might be that the first vehicles produced still had the rear driver's station until the stock of /3 hulls ran out. This is personal speculation, however. 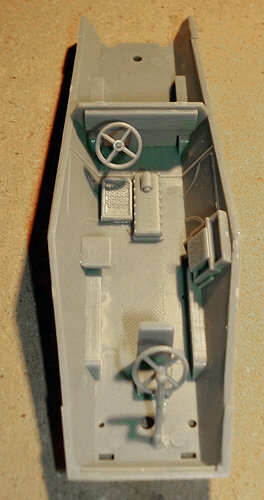 Final configuration of the lower hull interior... well, at least until I could dry fit the gun. The new final configuration of the lower hull interior... well, at least until I mated the fuselage halves. Adding the gun cradle to the diagonal U-beams took me almost two hours, as the cradle has to sit just right in all dimensions, reach the upper hull in the right place and has to be partially scratchbuilt. Only then could I dry-fit the gun. This showed that, as far as my AMS is concerned, it hid enough of the interior to avoid the need to add any detail to the inside of the upper hull. Unfortunately, it also showed that the radio (on the left) and the ammo box (on the right) interfered with the gun shield; their profile was lowered in situ. At this point I noticed that the Roden Pak shield doesn't have the cutouts at the rear. These were easily added. With the hull closed, even less of the interior could be seen. It would only be getting worse with the gun added. The gun assembly of the Roden kit is a fiddly affair and a bit crudely detailed. To complicate matters, the instructions are not the best either. The one thing going for the Roden gun is that it can be put in any recoil position (and can even move as no glue is required). Careful gluing will also allow movement in elevation and azimut. I decided to replace the gun barrel with a metal item from RB (72B05). It was at this point that I realized that I had kept very little from the Roden kit and that a far cheaper (and better detailed option) would have been to scratchbuild the hull roof and additional armor and use a Zvezda Pak 40, perhaps with the RB barrel. While mating the gun assembly to the lower hull I noticed that it wouldn't fit because it interfered with the roof. The reason for this was that the roof had been made narrower to fit the Hasegawa hull. Widening the rear cutouts solved this, barely. Note that the shape of the cutouts in the roof is not entirely accurate and neither is the angle of the Pak shield. A flakmount was added to the gun, sourced from the scratchbox. Having hesitated for a long time, I finally decided to go for the late style of fenders, as I only could find a single photograph of a /4 with early fenders. This required removal of the middle toolboxes (easily filled in), repositioning of the hinges of the remaining toolboxes from the bottom to the top (relatively easy as well) and move the recess for the padlock from top to bottom (rather stressful). Padlocks from Hauler were added to hide the lack of smoothness inside the recess. The whole affair took quite some time before it looked acceptable to me. The fenders of the /4 also had a completely different tool lay-out. 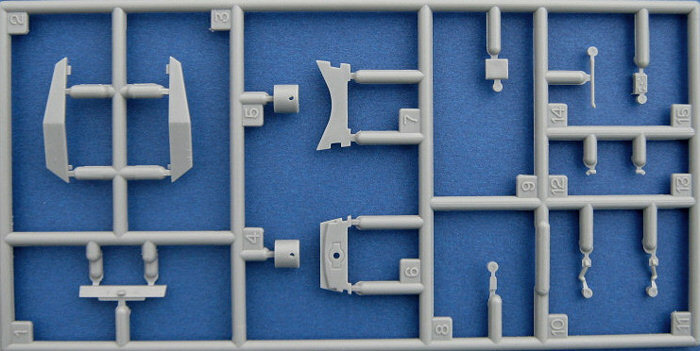 As half of the tools in the Hasegawa kit are molded on, the sanding stick and spares box (MR, Mars and others) were required to complete the task. The big box on the right fender, which sould have came from Roden, was scratchbuilt as the Roden part was far too big to fit the Hasegawa hull. Late in the construction I decided to add the walls for the fender stowage compartments. The wheels are stock Hasegawa items, mixing between the two types of hub and tyre that are provided. I could have used Roden hubs (which are better detailed), but shied away. Only one headlight was fitted, as standard for the /4. Late exhaust (i.e. vertical cylinder) were also fitted. These come with the /3 kit and are very much conjectura, as these might have been a post-war featurel. An antenna mount from BP resin and lift hooks left over from the CMK set for the Sd.Kfz.251/21 were also used. Based on information in  and , one of these vehicles was captured together with a number of 234/2s and 234/3s in Pilsen on the May 9th, 1945. It seems to have been with Stabskp./Pz.Aufkl.Abt.20 of 20.Pz.Div. As far as I know, there are three pictures of this vehicle, all taken after capture. One of these vehicles, using the Modell Trans conversion set, was already built by Tony Ivey. For my vehicle I followed the same approach as Tony, also using the Modell Trans set, even though I started from an Sd.Kfz.243/3. I replaced the wheels with those from Attack. It's a shame that the casting blocks weren't put exactly at the bottom of the wheels (with respect to their attachments). It would have allowed to easily hide the section with damaged thread detail. Now the modeler can either restore the detail carefully, or hide that part with some natural terrain features, also known as "mud". I replaced two jerry cans with empty racks from the Eduard PE set for the Sd.Kfz. 234/2. I also replaced the lifting hooks with those from the Eduard PE set for the Sd.Kfz. 234/2. I modified the lateral attachments of the front bumper, by removing some material from the corners of the fenders. Even though this is the fifth Hasegawa Sd.Kfz. 234 that I built, I feel this is the first time that this piece actually went on well. I replaced the width indicators with butterfly pins. For the sake of completeness, none were seen on the captured vehicle, but I noticed this too late. I decided to use the early exhausts, as these were the most common type and I do not have any pictures of those on the real vehicle. 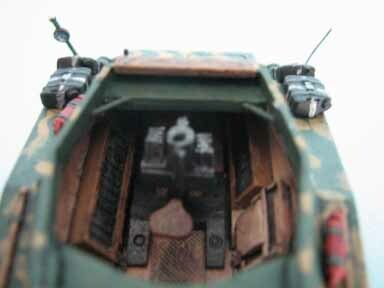 I placed the antenna in the Befehlswagen mount (just as Tony did), even though the pictures of the real vehicle show an antenna mount on the front right of the fighting compartment. I have difficulties believing that this was the original position of this item as it would have hindered operation of the gun enormously. I opened up the driver's visor. The visors are separate parts, but the opening in the hull needs to be done by the modeler. I only mounted one headlight, according to the pictures. Only if the vehicle were converted from a /2 would two headlights have been fitted. I didn't mount the cleaning rods, as I didn't see them on the picture and I don't think the 2cm gun would have used the type given in the kit. I don't think the extra toolbox on the left rear fender (as fitted to some Sd.Kfz.234/2s) was fitted either. As mentioned, I used the Modell Trans conversion set for the Schwebelafette. I found the parts to be rather brittle. They had a number of air bubbles and excess resin (probably because of damaged molds), while detail wasn't extremely sharp, except for the metal gun barrel. Locating pegs are not given. 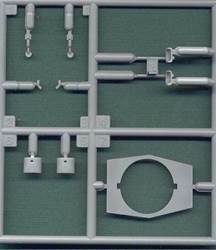 The set comes without instructions; only some pictures of the assembled gun assembly are given. I didn't quite manage to figure out how to fit the ammo clips in the interior as they seemed to foul the operation of the gun. As pictures of the interior of the real vehicle are not available, I was left to my own devices to figure out a way. I ended up slicing the part with the ammo boxes in half and fitting them on both sides of the hull. As far as I can tell, the second seat should go to the front of the gun (probably for the loader), but I decided to leave it off. I beveled the edges of the extra armor plates to make them appear thinner. I found these plates rather difficult to fit to the upper hull. Being resin, the necessity of using superglue didn't help. Next time I might scratchbuild these plates from plasticard, to get an easier fit. I actually ended up scratchbuilding some plates after all, as very late in the construction sequence I discovered that there was some extra structure inside the added armor plates, both at the rear (forming some kind of compartments) and in the front (where they seem the reinforce the corners of the upper hull). From the few pictures I have, it seems that the fighting compartment is open at the front up until the very edge of the armor plate. Modell Trans gives a shelf both at the front and the rear. I believe only the shelf at the rear is correct. The two handrails on the small "turret" armor appear to be higher up in the pictures. I didn't bother. The rear lower corners of the "turret" also need to be slightly beveled. 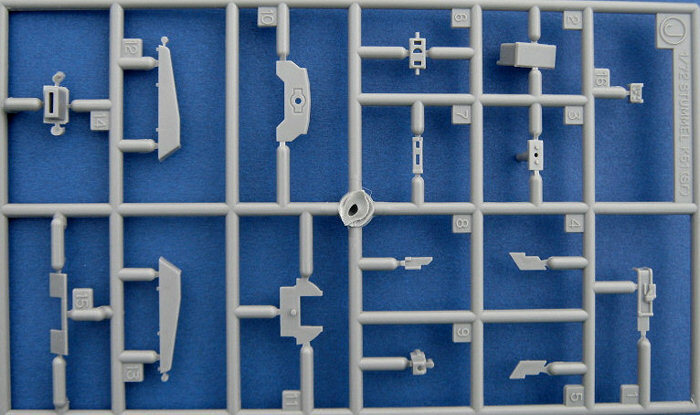 To Modell Trans' credit, they did capture the small offset plate at the top left, which Dragon didn't notice in their 1/35 kit. 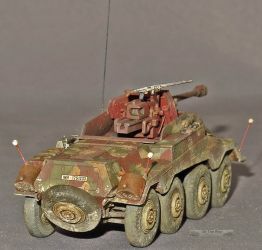 Picture from Dragon's 1/35 Sd.Kfz.234/3 w/2cm Schwebelafette (kit 6296) taken from Super-Hobby site. The manual asks to add two rods on top of gun: I am not sure if I installed them correctly. A small support for an AA MG (?) needs to be added to the additional armor plate at the rear. I first thought that I would need to add an aiming reticle, but it seems none was fitted to the real vehicle. In my opinion, the item seen in the pictures and that appears to be a wooden beam below the gun barrel was added after capture, but I might be mistaken. It is not given in the kit and I decided not to add it. Apart from these minor gripes, I believe the conversion set is accurate [9,10]. I decided to use the CMK engine set on this vehicle. The CMK instructions would only have you open the small upper hatches, but this would leave most of the nicely rendered engine invisible, especially the part to the rear. Instead, I decided to take off the whole of the engine deck and open the rear hatch as well. This made the upper hull rather flimsy, as not much plastic remained around the engine. I felt that the sides of the hull needed to be thinned down to scale, further weakening the structure. Comparing the instructions to pictures of the real thing, I noticed that the engine needed to be moved more to the rear (so the cylinders line up with the hatches) and the fuel tanks moved forward. This obliged me to add an extra section of engine shaft to link the engine to the bulkhead that separates the engine and fighting compartment. CMK asks to add tubing for the exhaust collectors. With the whole of the engine deck removed, these needed to go all the way to the mufflers. With the rear hatch open, I decided to remove the spare wheel (without tyre), as I think this would have been done to ease access to the engine. Late in the construction I also noticed that I needed to add some (as yet unidentified) detail to the inside of the rear hatch. People who prefer to keep the engine deck on, might give the use of the PART PE set a thought, as this would provide see-through louvers that would allow to peek into the engine compartment. Still, I don't understand why CMK gives so much detail, but only allows for two open hatches; adding the rear hatch would have been a real bonus. I don't know if my paint scheme is correct for this particular vehicle, and it most likely isn’t, but I painted it according to my research for a late-war vehicle: green-grey floor, white hull sides, exterior color on the visible parts of the interior. My floor and transmission box should probably have to be red primer (like the engine compartment), but as earlier in the war the crew complained that an overall red oxide interior was too dark, it might be that some manufacturers went back to the original scheme when they re-instated Elfenbein for the sides. The camouflage scheme and markings were based on the pictures of the sole known vehicle. The paintjob of the vehicle seems very worn, which I'd try to replicate by using Agama Patinators for the splotches and a lot of scratching and chipping. Balkenkreuze were sourced from Archer (for the hull) and Minitracks (for the turret). 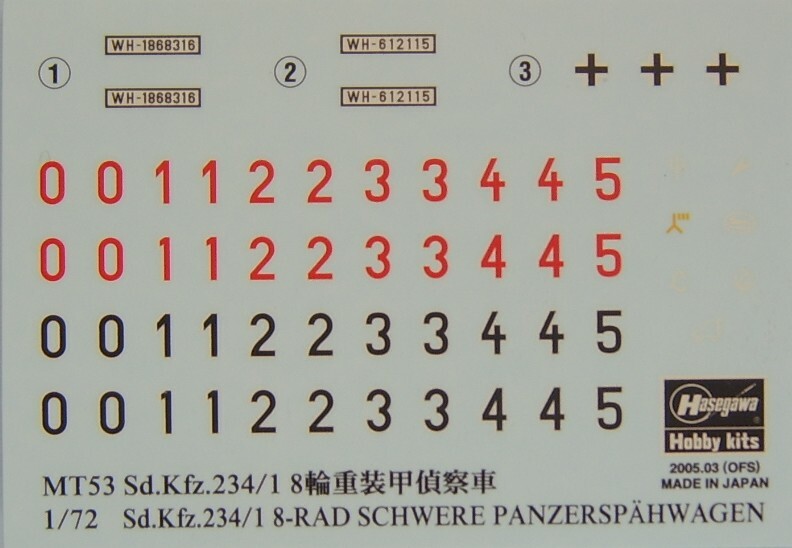 Licence plates were created with some spare black and white decal and with numerals from Dragon's Sd.Kfz.251/1 Ausf.D. While a real pain, these separate numerals allow the modeler to replicate any licence plate code, which comes in handy when building after historical references. This is a very elusive vehicle, with only a couple of pictures known of one vehicle most likely in Czechoslovakia in May 1945, possibly belonging to 17 Pz Div . It is not clear from the available information if the turret could turn. The pictures show two headlights, so it is most likely based on the Sd.Kfz.234/2. As word has it that more than one vehicle was so converted, I took the artistic licence not to faithfully replicate the vehicle in the pictures. 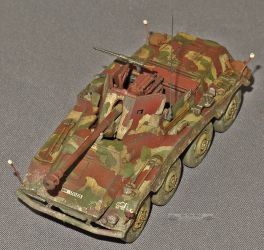 I used an Hasegawa Sd.Kfz.234/2 for the body and just added the Modell Trans Luchs conversion turret to it. It is not clear if the turret in the picture is an early or late type. I replaced the hatch on the turret (which was badly cast) with the corresponding part of the Hasegawa kit and added a periscope base to the inside. The gun barrel was replaced with a brass item, which I believe came from Aber, but it is difficult to tell as I have a large stock of 2cm KwK barrels and they come from different sources, all thrown together. The turret MG came from Aber. 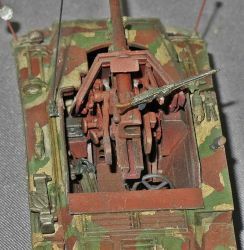 An antenna made from an insect pin and handholds made from copper wire were also added to the turret. The turret is solid, with a recess for a commander figure, which will be added later. Normally, in this configuration, nothing can be seen of the interior. I did open up the front visor, but this will change little. Consequently, I left out all of the interior bits for further use on other projects. The cleaning rod on the left side of the hull (as per the /2) was left off and a star antenna from Modell Trans added, making this a (hypothetical) command vehicle. I also chose to use the extra box on the left rear fender instead of the jerrycans, which is purely speculative. The picture of the real vehicle also shows some non-standard boxes fitted to the fenders. I used the kit wheels, but mixed tyres and hubcaps. The spare wheel was left off. 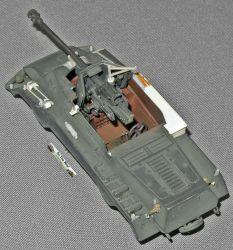 Note that the Modell Trans turret slightly overhangs the hull, which is not the case in the picture of the real vehicle. So either the turret is a bit too wide, the hull a bit too narrow at the top, or both. 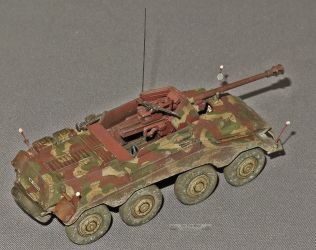 Schwerer Panzerspaehwagen (Sd.Kfz.234), T.L. Jentz, Darlington Productions. Schwere Panzerspahwagen (7.5cm), Sd.Kfz. 234/4, AFV interiors. The site is long gone, or perhaps turned itself into a part of this commercial site. It can still be retrieved with the "Wayback Machine" though". Panzerwrecks 4, L. Archer & W. Auerbach. Panzerwrecks 15, L. Archer & W. Auerbach.